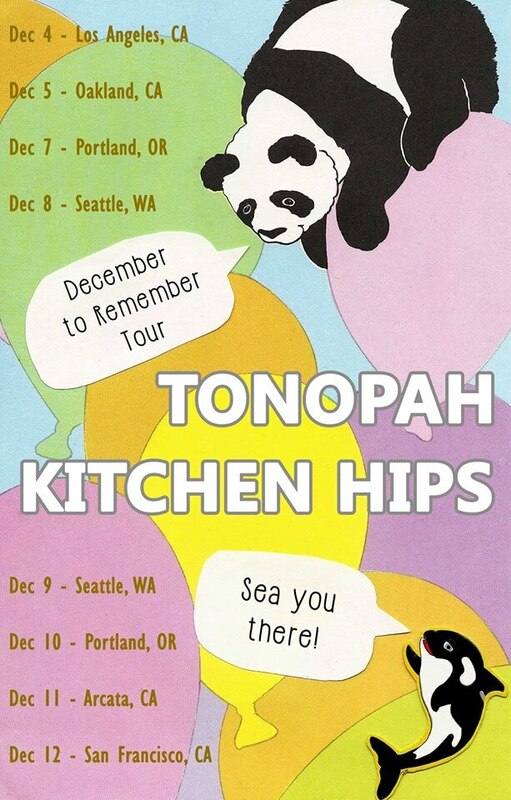 Tonopah and Kitchen Hips are two ice cream devouring bands from LA that are going on a West Coast tour, and dropping down in the Bay Area twice along the way. Both very genuine bands filled with enthusiastic ladies that are making music without apology, because that's what they love. Tonopah's first full length album Always Almost is dropping December 5. The Bay Bridged: Let’s get to know you guys... Where are you all from? I know you’re both situated in Los Angeles, but what brought you guys together? Effie: Hi, I’m Effie - Tonopah is my band! 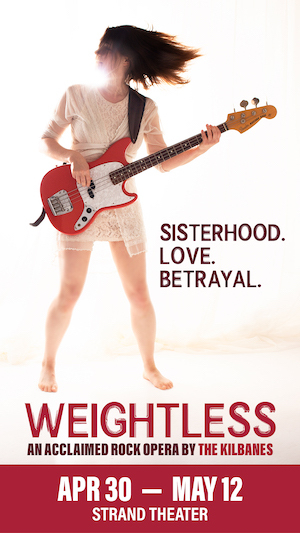 Aerienne: I’m Aerienne - I play lead guitar in Tonopah, and I also have my own musical project, Kitchen Hips. We’re touring together! I’m originally from the Midwest, but I’ve been in California for 7 years now - I love the West coast. Effie: I was born in London, I grew up in Las Vegas (hence the Nevadan band name), and lived in Berkeley for a while before moving to LA three years ago. I met Aerienne through Couchsurfing; I was visiting LA to teach guitar at Rock and Roll Camp for Girls. Aerienne: Yes, we met on the internet, lol. Effie: We both have a similar enthusiastic energy, which brought us together as friends and musicians. Aerienne: I agree - I feel like there is a lot of apathy in music these days, and I really admired Effie’s genuine approach to performing; it’s very earnest and honest and I love that. I think we both try to embody that spirit when we play, and that’s part of why we’re touring together. TBB: So you guys are about to go on a West Coast tour, but this tour also celebrates the release of Tonopah’s first album Always Almost? Tonopah always reminded me of 90s UK twee with a mix of the dreamy DIY sound that is happily going strong lately. What does this album have in store and how excited are you? Effie: I love twee! I am British! I am from the ‘90s! Always Almost is a collection of every song I’d written up to point of recording it, so it’s a mix of really different songs; I think what ties it all together is a theme of bittersweet - of hopefulness and disappointment, but mostly hopefulness! Aerienne: I’m excited for people to hear me shred! Effie: We have a lot of catchy guitar riffs! I most identify as a guitar player, but I write all the parts except the drums and some of Aerienne’s solos. I think it lends the songs a bit of a unique sound, because I write what I think sounds interesting and fun and layer in a melodious way. TBB: I know you all tried to stick with DIY spaces for the tour, what does the DIY scene mean to you? Also how hard was it to book the tour by yourselves? Aerienne: I wouldn’t necessarily say that it was intentionally all-DIY, but we certainly align ourselves with the DIY ethos. Being able to play shows that are all-ages, donation-based, and not in bars is generally more conducive to a fun time, both as a musician and a music-lover. DIY shows are less about turning a profit and more about creating memorable and exciting events. As a touring musician, of course making money is part of the perogative, but the community is very supportive of artists. There’s so much work that goes into booking your own tour; this is my second tour as Kitchen Hips, and I learned so much the first time around! At the same time, it’s a labor of love, and I really enjoy seeing all the emails and Facebook messages to strangers turn into memories, friendships, communities, and collaborations. I can’t wait to hit the road again! Effie: I was lucky because Aerienne had just returned from her Kitchen Hips Midwest + South tour when we decided to book this one, so she had experience and plenty of tips for how to do a DIY tour! We’ve got similar planning styles, so it was great to have a partner-in-booking for my first time. TBB: What were your favorite bands in high school? Especially at 14? Since that tends to be the age where everyone starts really getting their own taste and finding music that ends up meaning everything to them. Biggest influences? Effie: I’m wearing a Rilo Kiley t-shirt right now! Jenny Lewis is by far my favourite. At 14 I think I was listening exclusively to Elton John, but it was at 15 was when I first heard Rilo Kiley, Camera Obscura, Feist… all the indie pop rock bands with cool women fronting them. When people tell me that Tonopah reminds me of any of them, that’s sure why! My favourite eras of music are the late 30s to early 60s, and that’s definitely influenced my songwriting as well. Aerienne: Oh my gosh, this is such a fun question! I grew up listening to Bob Dylan, The Beatles, the Kinks, etc -- so when I had the chance to carve out my own musical taste, I became obsessed. Fave bands at 14? The Strokes, Rooney, The Thrills. Basically cute boys with mop-tops. Jenny Lewis was also the first female singer I fell in love with! I wouldn’t say that’s had too much of an influence on the music I make now, though. Current influences? I love old soul songs, country, and witty women: Sibylle Baier, Patsy Cline, Cotton Jones, old-timey jazz and folk songs -- the good stuff! TBB: Tell me about your favorite zines? Favorite female musicians? Who are some current female/queer bands that you’re really excited about? Aerienne: Cate Le Bon is a serious shredder from Wales with an amazing voice and a knack for sincerity in songwriting. She is a guitar-playing heroine. I also love Bachelorette; dreamy electronic musician from New Zealand who writes songs about drinking tea who also has a beautiful and unique voice. It’s like a mathy lullaby. Check ‘em out! TBB: If you could book your dream show, with both Tonopah and Kitchen Hips included, who would play with you? Effie: All my favourite bands are my friends’ bands that I’ve already played with! Oooo ohmigosh could we open for Dolly Parton? Aerienne: Can Sonny & the Sunsets play? Effie: At Dollywood Theme Park! Perfect show. Aerienne: Yes! With special surprise guests, The Spice Girls. TBB: Tell us Bay Area folk about Gal Palace? Make us drool with envy. Aerienne: Gal Palace is a DIY collective organized by a group of 5 of us gals, plus a larger community of friends, fans, and collaborators. We put on shows and events predominantly featuring female performers. Every show we put on has, at the minimum, one female-fronted band, but usually more! In addition to music, we also host a Feminist storytelling party, organize the Los Angeles Feminist Amateur Basketball League, have comedy shows, karaoke parties, and put on a seasonal queer community mixer. Effie: It kind of reminds me of the Bay in a way; when I lived there, I started going to queer punk house shows and first realized that DIY was something that could be done! TBB: Kitchen Hips is coming out with two new albums? The 4th and the 5th are supposed to be going in a bit of a different direction? What direction is that? Aerienne: Well, who knows when they will come out? I’m constantly confused about that. But yes, I have two albums in the works! The first of which was recorded in February, and it’s a companion piece to my 2nd album, Lazy Weather -- it’s called Lonely Weekend. We recorded it in my bedroom over the span of a weekend with my woodwind genius friend, Will -- it’s got a lot of fun clarinets and flute parts on it. I’ve been resisting releasing it, because I’ve self-released everything up until this point, and I was hoping to put it out on a label. It’s been sitting on my harddrive for almost a year now, so pretty soon I think it’ll burn a hole in my pocket and I’ll just put it on a cassette and get it out of my head. That’s what always happens! I’m an Aries, so I’m impatient. I’m in the process of writing songs and material for a 5th album -- on my other albums, I’ve primarily written songs for the banjo, and they’ve been very folksy and melodious. Now I’m writing on the guitar and making space in my imagination for a full band. On the next album, I’d like to bring in a wider variety of musicians and instruments, give it a fuller sound, and really explore the dark side of myself and my music. I love sad music! But I also love bad jokes and laughing! I want to play with the duality between sadness and happiness, between falling into a hole and falling in love with yourself. TBB: Oakland is one of the first stops on your tour while San Francisco is one of the last...So if folks go see you in Oakland and love you, they can also see you again in SF with more friends almost a week later. I am probably going to do this. What are you looking forward to on this tour? Any crazy day dreams about what could happen? Effie: I’m looking forward to being in a car with my band for 10 days. Nearly all the road trips I’ve ever gone on have been with my family and mostly out around the desert, so I’m excited to go city to city and send lots of postcards home. And, of course, being able to spend such a large block on time enjoying being a musician without all the other things in life that sometimes get in the way. Getting to play my music for so many new people, and reunions with friends up and down the coast. Aerienne: I second all of what Effie said! I’m also excited for infinite grrl time sleepovers, meeting new music pals, bundling up, singing my heart out, seeing the redwoods, seeing REAL stars (not the Hollywood kind), playing with other people’s cats, inventing road games, and getting our disposable cameras developed afterwards! Effie: I had a nightmare last night that we were leaving for tour tomorrow and I had no idea what to pack and my suitcase was too small and I was stressed out! So that is a real crazy night dream. Aerienne: I just dream of lots of people enjoying the music that I make, and maybe if I put myself out there, more people can find it and love it. I’d like to think that dream isn’t too crazy.